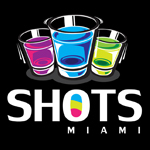 SHOTS was born in the great City of Miami on the first day of Art Basel 2012. We saw a need for something different in the nightlife scene. We opened a 2K Sq Ft venue which we quickly converted to 7K Sq Ft after realizing the impact we had on the market. Miami has been the laboratory where we have perfected our recipes, mastered our processes and trained our experts. Our brand has been impacted by the City of Miami, its culture, the arts and nightlife. We are proud of our origin and aim to spread this Miami infused brand throughout the world.